When people think of paradise, Bali is one of those places that comes to mind. Tropical and warm year-round, vacationers come from all over the world to sample this “Island of the Gods”. As a get-away destination, few places can match the picture-perfect beaches and the gentle smiling faces of the Balinese. No wonder, too, that Bali was the “Love” in the Eat, Pray Love book. We at Arya Amed Beach Resort & Dive Center would like to welcome you to our little corner of this Island paradise on the lush green eastern coast of Bali. Here, you will be received by attentive staff as you make your way down the tropical meandering path gently sloping down to the infinity pool, restaurant and beach. Your room is cozily tucked among lush green gardens. Arya Amed is also located in the middle of some of the best diving and snorkeling Bali has to offer. And, one doesn't have to travel far because right on the property Arya Amed Diving is ready to cater to your every ocean need...be it on the surface of the water or under the water among the myriad of colorful and varied fish and corals. Come enjoy a relaxing hide-away in the middle of magical Bali. 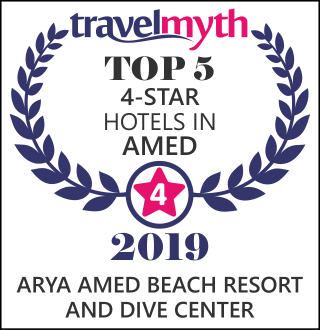 Visit us at Arya Amed Beach Resort & Dive Center. Kami sangat senang menginap di Hotel Arya karena di hotel ini sangat menyenangkan. Yang kami senangkan adalah kamar-kamar yang bagus dan kami sangat senang karena makanannya enak.